Huntington Beach, Calif. - Rain, rain, go away... 136 meets and never rained out, today was questionable. I showed up at 1:30 and it was lightly raining. Frank Colver showed up early and then Debbie and Tom Hopkins. We were discussing our rain plan and possibility of postponing the meet for a week. 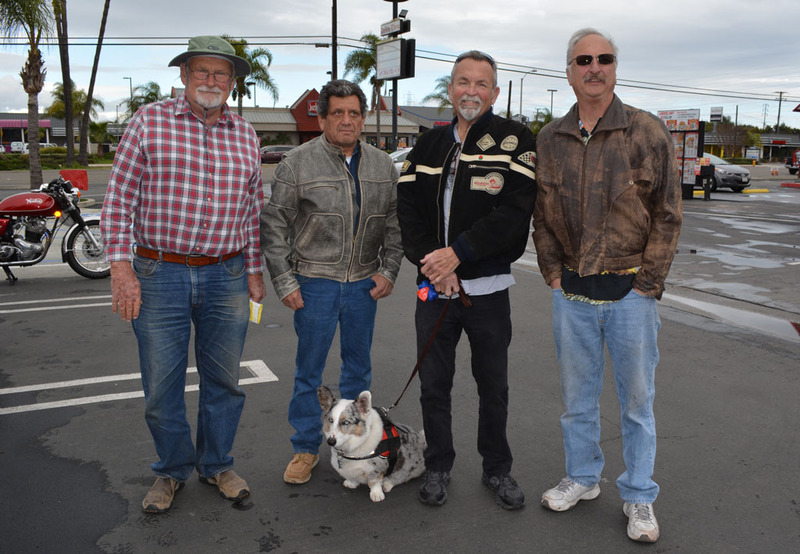 Suddenly the sky cleared up and Hobie Ladd rolled in all the way from Los Alamitos on his 1965 BMW R27 (249cc single). The meet was on! 18 people braved Stormwatch 2019 to ride in. Actually we had more than 25 people at the meet, 11 vintage bikes and 7 newer models. The weather was holding out well for about 45 minutes when I was thinking of calling for votes early. 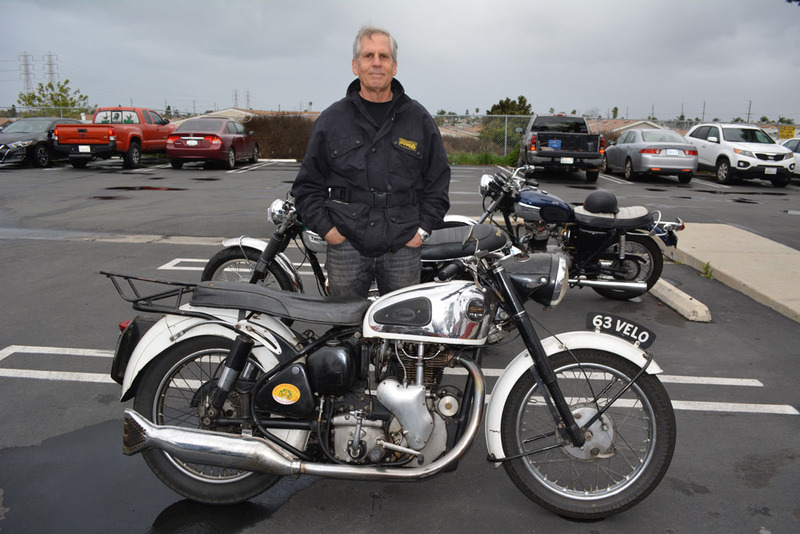 Jeff McCoy showed up at 2:55 on his pristine 1950 Norton ES2. I had to include his bike in the contest, so I extended the voting until 3:00 when the rain started in again. 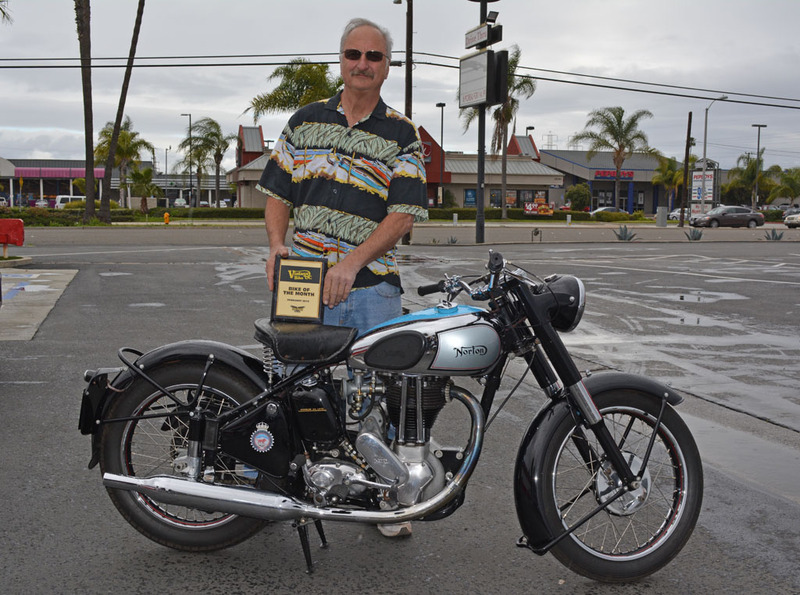 Congratulations to Jeff McCoy of Huntington Beach for winning Bike of the Month with his 1950 Norton ES2. Jeff won the Bike of the Month plaque provided by Russ Brown Motorcycle Attorneys. www.RussBrown.com. Jeff is one of the original members of this group. He has been a member longer than I have and he has a fantastic collection of motorcycles. Every one that I have seen is remarkable, but he usually shows up later, and scoots out early so he's rarely in the running for Bike of the Month. Read all about Jeff's 1950 Norton ES2 on our Bike of the Month page. Larry Luce of Huntington Beach came in Second with his 1961 Velocette MSS. Larry has been attending the meet for a long time too. Unfortunately I didn't get much chance to talk with him about his bike. 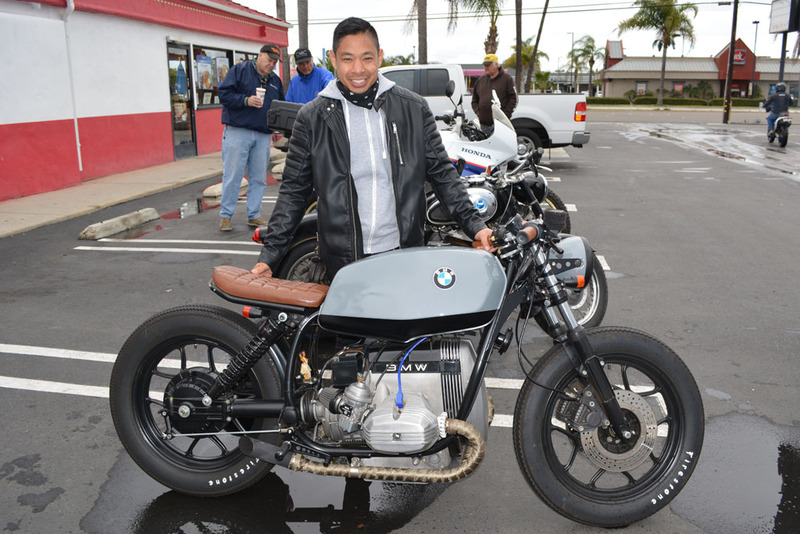 Rod Maralit of Irvine took Third place with his custom 1984 BMW R65LS. Rod is a newcomer to the meet, but his BMW is a crowd favorite. I think he's been to the meet three times and placed twice. Rod inherited this bike from his Uncle Roland Manguerra a year ago. The bike was 100% original when he got it and he spent the past year in a cargo container workshop customizing it. Frank Colver, Carl Felix, (Rollie*), Greg McBride & Jeff McCoy. These guys have been coming to this meet for over 15 years. Greg McBride and Thomas Harper started this meet at Mossimo's Pizza back in 2004. All four of them have impacted my life as many people in this group have. Thanks to everyone for showing up and making this another great event despite the weather. A special thanks to the team, Tom & Debbie Hopkins and Tink Tinkler. I'll see you next month on March 10, 2019. *Rollie is not a member of Vintage Bike OC. Any resemblance to a member is purely coincidental. Dogs currently are not allowed to join our emailing list unless they are over 18 years of age or have signed written conscent of a parent.